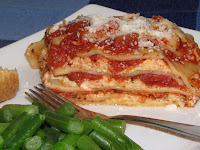 This lasagna in particular uses regular noodles, but they aren't cooked first. 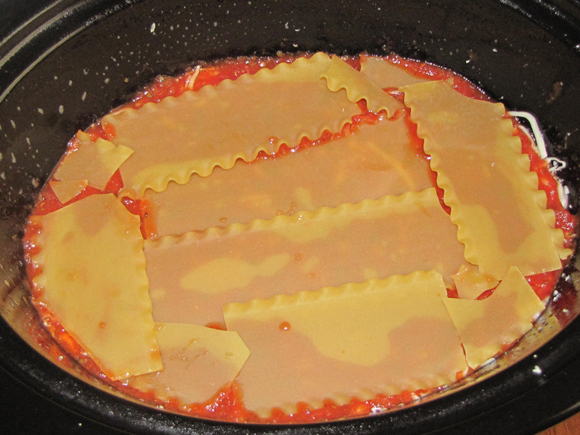 Yes, there are the no boil ones that you can use in a regular lasagna, but the texture is never the same. They have an almost leathery feel to them and well, that's not what I'm looking for in a lasagna. 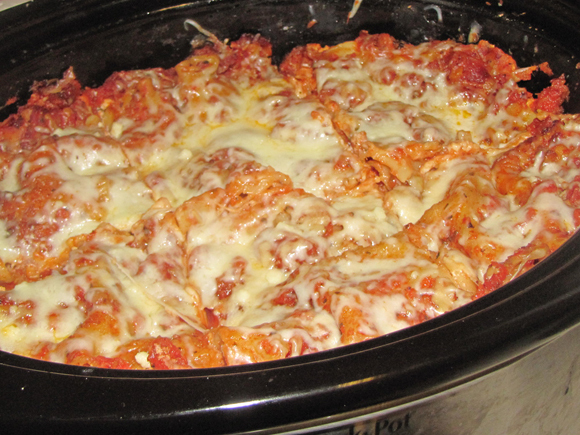 The noodles in the crock pot recipe are really tender and cooked perfectly. I was also worried that everything would fall apart when I took it out, but it held together nicely and looked, well, like a lasagna! That's always a plus! Oh, and it makes a ton. But, come on...who doesn't like leftover lasagna? Leave a comment below to let me know what you think of this recipe! 1. Mix cheese mixture ingredients together in a bowl and set aside. 2. Mix sauce ingredients together in another bowl and set aside. 3. Grease crock pot with non-stick spray and pour about 1 1/4 c sauce on the bottom. 4. Place about 4-5 noodles over the sauce in a single layer. You can overlap slightly but not too much. Make sure all the sauce is covered - break noodles to fit. 5. Spread 1/3 of the cheese mixture over the noodles then pour about 1 1/2 c sauce on top. 6. Sprinkle 1 c mozzarella over the sauce. 7. Put another layer of noodles, then cheese mixture, then 1 1/2 c sauce, then mozzarella. 8. Add another third layer noodles, then cheese mixture, then 1 1/2 c sauce, then mozzarella. 9. Top with remaining noodles then remaining sauce. 10. Cover and cook for 4-6 hours on low. 11. When done, turn off heat and sprinkle a little extra mozzarella on top if desired. Let stand for about 15 - 20 minutes to firm up.